Rose gold latex balloons, perfect for any occasion either on there own or part of a display. With this highly popular trending colour right now you can't go wrong! 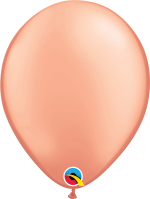 The rose gold latex balloon is used for any occasion including wedding's, birthday parties, corporate events, baby showers ect. Sold individually which means no restrictions to how many you want to buy!